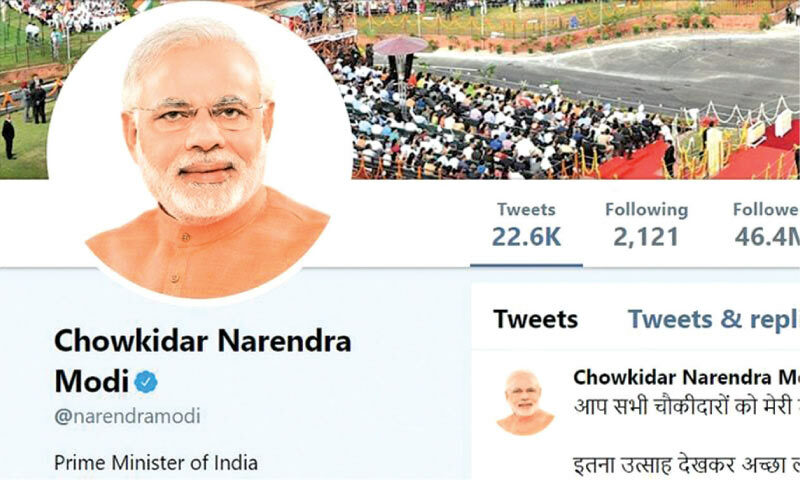 Prime Minister’s Narendra Modi’s twitter handle was changed to ‘Chowkidar Narendra Modi’ . INDIA: India has entered full election mode: voting is due to begin on April 11 with the final ballot cast more than five weeks later on May 19. The newest buzzword on the campaign trail is “chowkidar” or “watchman”. Prime Minister Narendra Modi has used the term for a while now, telling the people that he is their “watchman” - someone who looks out for them and serves them. However in recent weeks, he has really upped the ante, even changing his Twitter handle to “Chowkidar Narendra Modi” - prompting other senior members of his Cabinet to do the same. He is also going to address a crowd of 250,000 watchmen across the country through an audio link on Wednesday. Firstly, it is a clever use of the term to address the issue of national security. Last month’s suicide attack in Indian-administered Kashmir saw the entire discourse around the election shift. Modi and his government had been battling real discontent over issues like rising unemployment, increasing farmer suicides and a slowing economy. After the attack in Pulwama however, all this was laid aside in the interest of heightened patriotism and national fervour. When Premier Modi confirmed that India had carried out air strikes against militant camps inside Pakistan, his approval ratings soared. Even at that point, as he addressed a campaign rally in the northern state of Rajasthan, his message was clear: the nation is in safe hands. Since then - and in spite of a crackdown on the use of the military in campaign materials - Modi and his party have ensured it is national security, and not the other issues, which are firing up voters. The second reason this is important is the fact that Prime Minister Modi is once again demonstrating he is utterly in control of the narrative - forcing opposition parties to counter him on his own terms. So even when a leader like Rahul Gandhi says “Chowkidar Chor Hain” (The watchman is a thief), he is still essentially playing by Mr Modi’s rules.